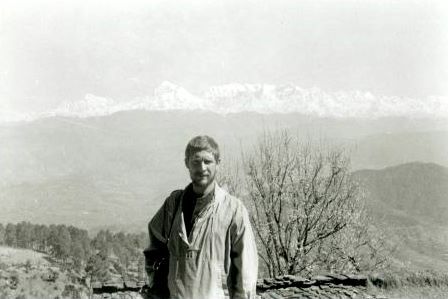 Here’s an image of Snyder in his younger days when he traveled to India with Allen Ginsberg and Peter Orlovsky. I post this because this is National Poetry Month. >Here is a clip of Allen Ginsberg reading one of his poems, Kraj Majales (King of May). Sitting next to him is Neal Cassady, inspiration for the character Dean Moriarty in Jack Kerouac’s novel On the Road. I believe they were at the famous City Lights bookstore in San Fransisco. Years ago, when I was on a business trip to the bay area, I drove into San Fran just to find City Lights. I was surprised by how small and quaint it is. But the walls practically ooze beat coolness. This is part of a three-part posting taken from a brief lecture I gave during a film class. In order to understand art-cinema narration, and the underlying post-Enlightenment project, one needs to grasp the historical and philosophical pressures that gave it birth. The coming of the 20th Century, bringing with it so many new technological changes, and dragging along with it the those 19th Century harbingers of new ideas: the industrial revolution, Darwin, Marx, and Freud, seemed, in many people’s minds, to have changed everything. The path of the 20th Century, with the devastation of the First World War, the horror of the Holocaust, both the reality and threat of nuclear weapons, and the waning of Christianity in the West, gave impetus to new challenges. Human beings now struggled with the loss of God, of place, of self, of truth, even of time thanks to Einstein. This has been called, amongst many other things, the “crisis” of modern man. It is also, as some have said, the burden of freedom. Dostoyevsky pointed this out, when he wrote in the Bothers Karamazov, that if there is no God then everything is permitted. Some saw this as their salvation, some saw it as their undoing. People began to question everything once taken for granted and to see life as much a struggle to find oneself, to understand the nature of love and sexuality, to discover meaning, and to mourn the evaporation of Truth, as it is a struggle over the more common difficulties of living – like saving the world or saving the farm. In fact, it all gets turned on it head so that saving the farm (and even saving the world) seems so trivial compared to the inner turmoil now plaguing modern man. Why bother with saving the farm if you can’t even save yourself? Of course, it’s not all doom and gloom, at least in terms of how people live their lives. There are still a lot of life affirming choices people make, but underlying it all, especially from a Christian perspective, is a great sense of loss and uncertainty. And of course, from a Christian perspective, the problems of human beings are not ultimately the result of mere historical forces, but arise from the deeply profound tensions between being made in the image of God (and all the glory that that means) and being burdened and affected by the corrupting nature of our inherent sinfulness (and all the difficulties that that means). Cinema, then, confronted these changes and perspectives by challenging conventional wisdoms of narrative structure and subject matter. Art-cinema narration can then be understood as a response to a post-industrial, post-Christian, post-Enlightenment world. This is part of a three part posting taken from a brief lecture I gave during a film class. Classical Hollywood Narration presents rather clearly defined individuals struggling toward rather clear-cut goals. These characters move and have their being within clearly presented worlds according to clearly understood time and space norms. And when all is said and done, when the story has finally concluded, these characters have unambiguously either reached their goals or not reached their goals. Typically causality, that thing that keeps the story moving forward and gives a reason to do so, is also unambiguous – such as the solving of a crime, saving the world or saving a private, falling in love, wining a race, escaping death, killing a giant shark, blowing up a deathstar, running from dinosaurs, throwing a ring into a volcano, disarming a bomb, bending it like Beckham, and finding a Nemo, etc. Life, that great big thing that we are all doing, is typically presented as coherent and free of ambiguities – at least true ambiguities. Characters do have decisions to make – and even decisions are between right and wrong itself. But the characters are understood, the decisions are understood, the world is understood, and we are along for a story that rests upon, and works within this clarity. Of course there might be moments of confusion, but that is part of encouraging tension in the viewer for the purpose of moving the narrative to its climax. In the Classical Hollywood Narrative those moments of confusion are never too long and ideally are not left unresolved at the end of the film. And an incredibly large number of films have been exceedingly successful within these parameters. But is life always neatly arranged, clearly understood, free of ambiguities, plainly motivated, distilled into lucid and obvious choices? If the Classical Hollywood narrative film has it roots in 19th Century drama and short stories (with Edgar Allan Poe being a prime example), then what is often called Art-Cinema Narration has it roots clearly in the 20th Century (with writers such as Anton Chekhov being a prime example). Art-Cinema is firmly a 20th Century phenomena. 19th Century drama is about characters, who in the midst of life, are confronted with some external situation (maybe rather ordinary or rather extraordinary) which they must resolve or come to terms with. An internal, spiritual, mental struggle might play into the larger goal of the external struggle, but is ultimately subservient to it. 20th Century drama is about characters, who in the midst of life, are confronted with some internal, spiritual, mental struggle with which they must resolve or come to terms with. An external situation may play a significant part in the larger, internal struggle, but is ultimately subservient to it. Remember, there are many exceptions to this division. The 19th Century writer Fyodor Dostoyevsky being just one.